At the end of the nineteenth century, when Gustave Sennelier started developing oil colors for his artist customers who would eventually include Cézanne, Gauguin, and Picasso, he recognized the need for producing paints that only contained the highest-quality pigments. In order to craft superior colors, he verified that the origins of the pigments were from selected traditional sources, at the same time precisely identifying their chemical characteristics. His great respect for these materials not only ensured the permanence of works created with his paints, but also assured the production of an increasing array of unique colors of unsurpassed beauty and quality. Since that time, some pigments have disappeared because their natural resources have been depleted, and others have been restricted due to their toxicity. However, the company's recent research and innovations have resulted in a wide variety of synthetic pigments that perfectly match the performance of ancient mineral pigments such as Lapis Lazuli and Cinnabar. Sennelier still mines the Earth for minerals and other natural elements from traditional sources — pigments like clays and iron oxides used in ochres and the preparation of “burnt” earth colors from calcified soil. 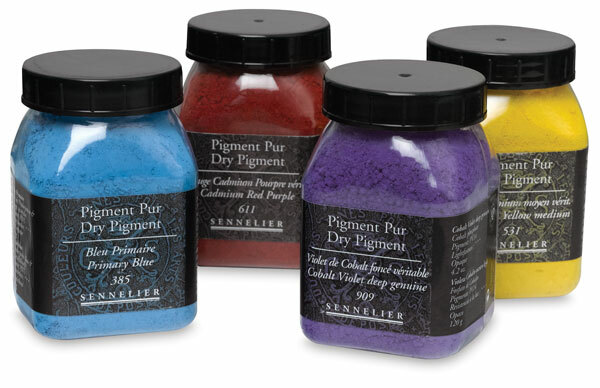 Sennelier keeps a watchful eye on the pigments selected for its lines of extra-fine oils, oil sticks, watercolors, soft pastels, and oil pastels. These very same pure pigments are now available to artists wishing to master the preparation of their own colors. Watercolor, gouache, and tempera require the addition of a hydroscopic product such as glycerin, which slows their drying time and makes them more flexible. The natural binder, either an animal or vegetable base, requires a preservative agent in order to preserve the integrity of the paints. For all shades of oil colors, the preferred binder is refined safflower oil or linseed oil, except for whites and very pale blues, for which poppyseed oil is sometimes recommended. For grinding colors, use a glass muller on a sheet of glass or polished marble. Be careful not to add too much oil when grinding, because the longer you grind the paint, the more fluid it becomes. Each pure pigment has a particular chemical nature and requires specific treatment.